The welcoming of spring has been matched with exciting new happenings here at CCE, including the official launch of both our Massachusetts Personalized Learning Network and Performance Assessment for Learning Micro-Credential Project. Today, I am happy to introduce CCE's latest endeavor : Our Blog! Launching today, Our Blog is a place to read CCE staff and partner reflections on our work - as we join together to create schools where learning is engaging and rewarding, and every student is set up for success. We will be updating the blog regularly and invite you to read our writings and share your thoughts, as we build a vibrant discourse around CCE's vision of equity and excellence for all students. Our first blog posts include a Welcome and my own reflection on Personalized, Equity-Minded Schools. We are excited to announce our new partnership with the Center for Teaching Quality and the Rhode Island Department of Education to launch the Performance Assessment for Learning Micro-Credential Project . Funded by the Center for Innovation in Education and Next Generation Learning Challenges as part of their Assessment for Learning Project , this initiative will build the capacity of Rhode Island teachers to design, field test, and score high-quality performance tasks. Drawing on CCE's Quality Performance Assessment program , the micro-credentialing system offers an innovative, scalable, and sustainable model for building educator capacity in the design and implementation of performance assessment systems. We will be preparing educators to lead their respective schools and districts to create personalized, proficiency-based learning and assessments for their students. To learn more, contact Gary Chapin at gchapin@ccebos.org . On March 16th, CCE gathered with teachers, teacher leaders, and school and district administrators from Framingham and Revere school districts to formally launch the Massachusetts Personalized Learning Network (MA PLN). The goals and activities of this first in-person gathering of the MA PLN Design Institute included opportunities for design team members to reimagine the purpose and structures of 21st century schools, discuss equity challenges in current school models, and think deeply about the network's six principles of personalized learning . At the conclusion of the energetic and exciting day, design team members reflected on their roles in the work of making learning personal in traditional public schools: "I am currently thinking about ways to bring the excitement I now feel to my colleagues. Before today, I did not fully understand the excitement of the pioneering role we are playing!" The need for schools to instruct and assess critical habits, skills, and dispositions is stronger now than ever. But how do you assess qualities like "Collaboration" or "Creativity"? 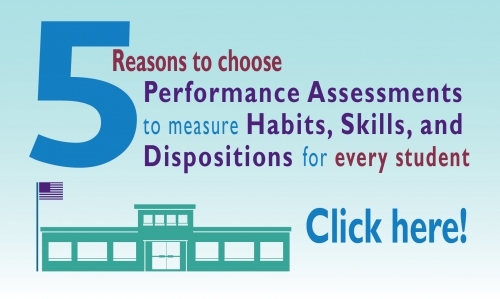 Our upcoming webinar presents a set of protocols and tools for developing performance assessments that are tightly aligned to habits, skills, and dispositions - including creativity, collaboration, communication, and self-direction. Register here and click on the image below to learn more! Check out this section each month to see our latest blog posts and updates! "I realize now that today's future graduates are not in need of [specific academic content] as much as they need skills and strategies to bring with them as they enter the workforce."